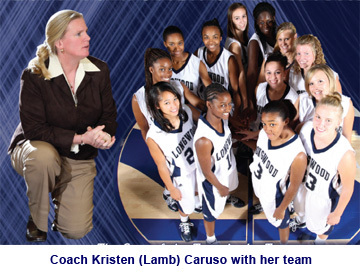 Kristin Lamb was a Guard for the UConn Huskies from 1986 – 1990. She was Coach Auriemma’s first recruit in his first year as Head Women’s Basketball Coach at UConn. Kris was Big East Freshman of the Year, a two-year team co-captain, and helped her team win it’s first ever Big East Tournament Championship. 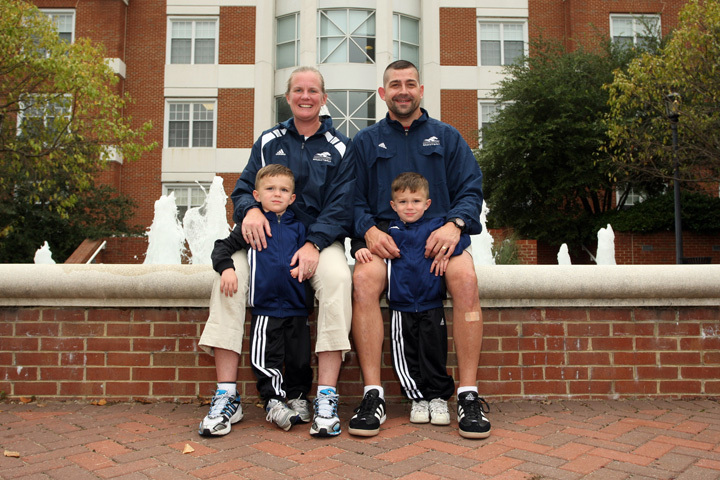 In March 2010, I had the pleasure of talking to Kris from her office at Longwood University, Farmville, Virginia where she is the head women’s basketball coach, about her experiences as both a player and coach. The transition from high school to college was hardly a factor. “I was a blue collar hard working kid. Coach gave me a summer work out program and I did it. It was my bible.” Kris came in as Coach Auriemma’s first recruit at UConn, she was in the starting line-up all four years and her junior year was the best. “Coach Auriemma had turned the program around in just three years. In that third year we won our first Big East regular season title, the Big East Tournament Championship, won 20+ games, and I don’t think coach has looked back ever since.” In her senior year one of the highlights was the opening of Gampel Pavilion. She’s in the record books too, as a freshman Kris scored 33 points in one game before there was a three point line. The record has since been tied but not broken after the three point line was added. Another record she holds is the most field goals in one game with 16. Kris earned her Bachelors Degree in Parks and Recreation and continued her education at UConn earning her Masters Degree in Sports Administration. While earning her masters degree, she became an assistant coach to Coach Auriemma for three years experiencing their first ever trip to a Final Four. Kris knew that she eventually wanted to become a head coach so she left UConn to become a first assistant at Duquesne University to get more exposure. It was a program that was being rebuilt. While there she helped to bring in better players and the team became better. Then a year back in Connecticut running Coach Auriemma’s summer basketball camp, a substitute teacher and junior varsity coach at Manchester High School. Next was Marist College another program to rebuild where she was an assistant for one year and her first head coaching position at the age of 25. “It was a program that was growing, rebuilding that I wanted it done overnight. I stayed there for four years until my mom back in Virginia became sick.” Kris took a year off and moved closer to home to be with family. The University of Hartford as an assistant was her next position under Head Coach Jen Rizzotti (former UConn standout). While at Hartford the team record was99 wins and 55 losses with four years of over 20+ win seasons. “We played in the National Collegiate Athletic Association (NCAA) Tournament and won a game. That win was a break through win for Hartford and to be a part of that was awesome.” Another great memory for Kris was the atmosphere at Hartford. 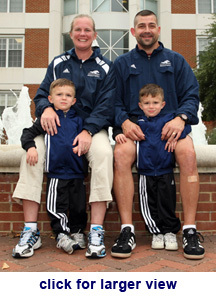 “It was similar to that at UConn, a staff that worked well together, and we were a very close knit family.” After five years, Kris reached her goal of becoming head coach again, now at Longwood University where she has been for the past three years. Her first year was a situation where the program had gone from being a Division II program moving up to a Division I. “That’s one of the reasons why the job was appealing to me. I was basically starting from scratch, and I would be able to put everything I had into this program.” Her first year was successful winning 16 games with a win at Radford University, the biggest win in school history. The past two years were a little bit rough but Kris is hopeful next year will be a break through year for them. Her immediate goal is to win a lot more games than they lose, and work to get her team into a conference before reaching long term goals of getting into an NCAA Tournament. Kris met her husband Joe while she was coaching at the University of Hartford. 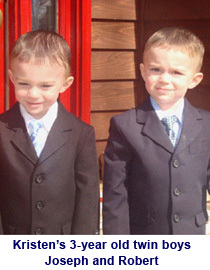 They have three year old twin sons, Joseph and Robert. The twins like playing both soccer and basketball right now spending lots of time at the gym with her team. The boys love being around her team and it’s a mutual relationship, the team loves the twins too.